From the moment you take the guitar for the first time in your hands, teachers, courses and basic books are teaching you how to use chords. Sound pieces composed of several notes that generate a specific sound, commonly used for rhythmic musical tracks or bases. But, every good musician should know sooner or later where these chords come from and how to use them correctly, how to combine them with other chords or notes within their scale and how to apply them along the neck of the guitar. Make sure to check our guide and be ready to tackle on any chord or song that stands before you in 7 days of full-motivated practice. Today we are going to dedicate a special article to summarize all the formulas presented in the series Construction of chords C. There are still, of course, many to be treated, so we will dedicate this special space to the chords that come from the natural scale. The purpose of this article is for you to know how to calculate the notes that constitute any type of C chord, how to put your fingers on the guitar to practice them, in what type of music or situation they are commonly applied and a few tips to make them easier. Most of the chords, especially those that are formed in the major scale, usually you can use them to take rhythmic tracks, harmonies with arpeggios or even as a base to build a fingerpicking and brutal solos. However, it is not as if there was an exact moment for its use, everything will depend on the sound you seek, the style of music to which you dedicate yourself and of course your personal choice; not all of the songs you know are tied to a single scale, and a dissonant chord every bit can generate a feeling of attention in the rhythm of the song.. Practice, practice, practice!!! 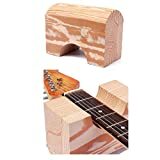 Get to it as much as you can, do stretching exercises for your fingers, and, as a general rule, when you go to slide through the neck of your guitar, it is recommended that you hold your hand in your thumb of the instep of the hand to make strength. C chords and E chords are probably the easiest ones, but, don’t worry about it if the sound isn’t perfect at the first try; depending on your guitar strings and their tension it can be easier or harder to press the note completely at the beginning, especially with acoustic guitars. The quality of your guitar plays a major role in the sound output, make sure to get the best acoustic guitar for a beginner and reduce the pain and hours of exercising. From this moment on, we are explaining the chords of Cmaj, Cmin, C7, Cmaj7 and Cmin7, their theories and variations. Commonly seen as just “C” this one is the main chord of the C major scale, and of course, the most common one. Cmaj is common in soft music, especially in the old country, rock, and blues like “ring of fire” by Johnny Cash and the acoustic version of “Zombie” by the cranberries. But the list isn´t near to end there. To put it simply, there should be only 1/2 tone between the 3rd and 4th notes, as well as between the 7th and final notes of the scale. Thus, giving you this scale as a result: C – D – E- F – G – A- B – C.
Now, for a Major chord, the formula is to simply take the notes 1, 3 and 5 from our scale, C-E-G. The first variation is the easier one, and you will probably use it a lot at the beginning of your journey as a guitar player. Remember the songs above? If you go with a slow arpeggio in the chords Emin – Cmaj – Dmaj – Fmaj you already get the intro to “The House of the Rising Sun” by The Animals. 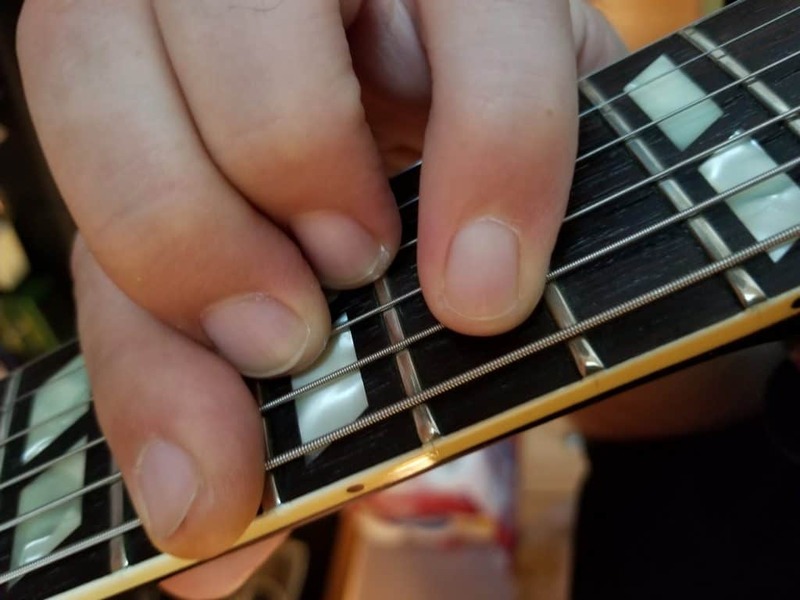 Now, for the second variation, you will need to use a bar once you are able to, but if you are not used to it, you can just skip the note in the 5th string and place your index finger where the bar begins at the third fret and on the first string as shown in the picture below. The third variation of Cmaj uses a bar as well, but in this case, you will have to hold to it either you can or not –This is where practicing until the bar doesn’t mute the sound of the strings comes in hand. In the 10th fret, you can find the 4th variation of Cmaj, this one is commonly used in high-toned songs and can be found in some of the arpeggios of the solo of “Hotel California” in its acoustic version by The Eagles. Finally, on the 5th fret is the less common variation of this chord, it uses a bar to cover the 2nd, 3rd, and 4th strings and rely on the deepness that comes from the 6th and 5th strings in higher frets, offering a less versatile and a bit harder to apply form of the Cmaj chord. Rock songs often have a sound that you won’t get with a clean amp, make sure to get the best pedals to improve the output of your music. The Cmin chord can be taken from either the Cmin scale, using the major chord formula, or our standard Cmaj scale, using the minor chord formula. As this article is about C chords. In the C major scale, the formula would be “1 – b3 – 5” which results in “C – Eb – G” as for Cmin formula. If you did it the other way around, using as a base the C minor scale, the result would be the same as the third tone of the C minor scale is Eb which would be taken by the “1- 3- 5” formula. The first variation of this chord is quite simple, and the sound output you will get from it feels classical. On the downside, that would be the only way to play it in the first frets without using a bar. The second and third variations are really easy if you dominate your bar, as they are fret-up versions of Emin and Amin. 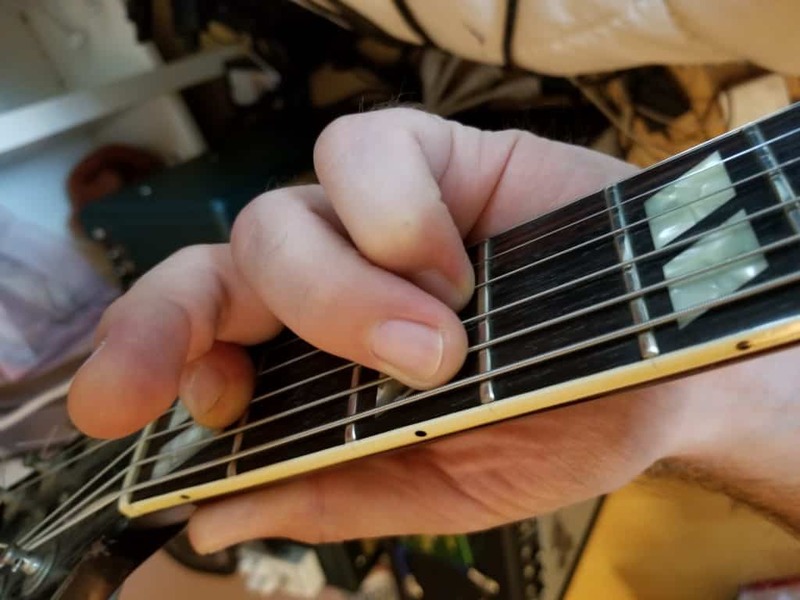 The tricky part of Cmin versions shows up in the 4th and 5th options, as they require you to place your fingers at certain distance, and in the case of the 5th version, make a partial bar with your 3rd finger in the 8th fret which can be hard if you have not enough strength in it. Have you been stretching your fingers lately? Things get a bit more complicated here. C7 chord has a bright and pretty sound that fits in many energy music styles such as Ska, soft rock, bright Jazz and pop; but in early ages –yeah, before the 50’s- this chord was more commonly used by gospel or classic dance rock stars like Elvis. As we said before, C7 offers some bright effect to the base C sound. And, even when it is rarely used nowadays, it does have some background for you to practice it. Let’s go back to the C major scale now and apply the Seventh Chord formula, “1 – 3 – 5 – b7” which gives us “C – E – G – Bb” as result. Remember when we said this part was complicated? Well, let’s get started here. The first time you will find C7 in your guitar requires you to have guitar that is consistent with the size of your hands, as for it requires that your 4th guitar fingers are placed really near to each other, and if the frets are too thin, you will probably be able to move faster with another variation. Thankfully, the C7 variation at the 3rd fret comes with an easy set, but you will need to dominate the bar before putting it through. Moving on to the 8th fret, you will find a slightly harder way to play C7, but this version guarantees a clear and smooth sound which travels very well among major and minor chords. Finally, the last 2 versions are the least common ones, but they offer a bright sound at the 10th fret and a darker one at the 5th managing a great output if used together. Cmaj7 has a brighter and lovely, maybe romantic sound than C7 and Cmaj; this is why it is more common in more fancy music styles and progressions like Jazz. Not limited to Jazz, this chord is still pretty uncommon as for jumping to it might be quite a professional task. Still, here is a list of renowned songs that contain Cmaj7. Severed Lips – Dinosaur Jr.
Jazz usually requires a lot of fingerpicking, and learning how to hold your pick right can be a great part of the deal. 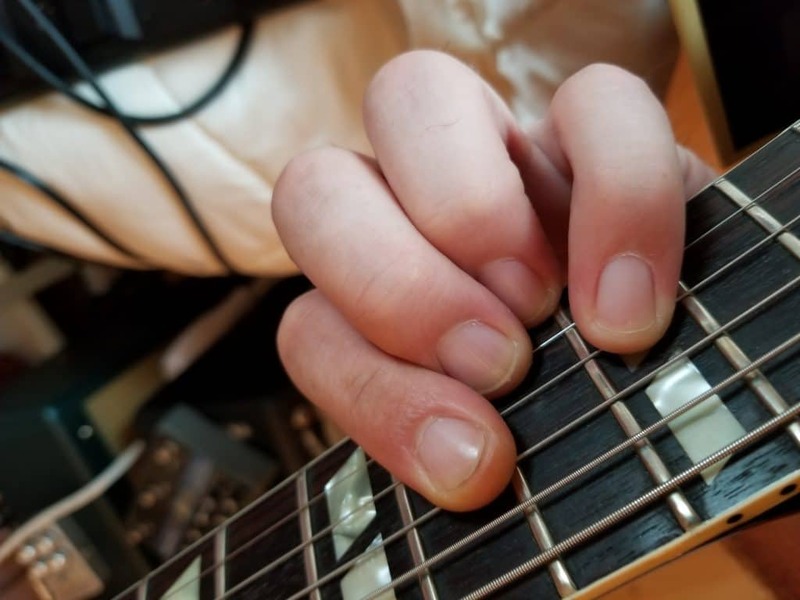 The most common and easy variation of Cmaj7 requires only two fingers; it is advisable to use your 2nd and 3rd finger leaving the index finger free, the reason behind this is to allow you to use the index as base for the next chord easily –We know that using it is a temptation, but this way any beginner can reduce the clumsy away faster. The 2nd, 3rd, and 4th versions are easy to play as well, and they offer a quite bright sound that can actually outstand a lot in a deeper chord progression and allow you to jump to any arpeggio or fingerpicking bridge instead of another chord. Your last option is pretty uncommon but it is still easy to use and despite that most of the sound will come from the 6th string, it will still offer a bright, yet more robust, sound. 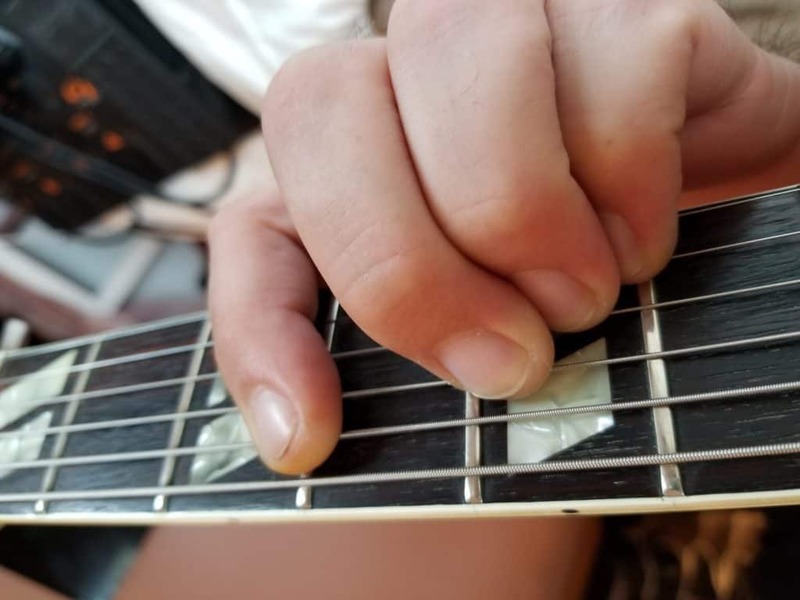 Cmin7, also referred to as Cm7, is a non-versatile chord, its sound is bright and low in most of its versions and it has “a lot” of versions through your guitar’s neck. You will usually find it in very harmonic and probably somehow dissonant songs like “This Love” by Maroon 5 and classical music pieces like Impromptu in Eb no.2 by Franz Schubert. 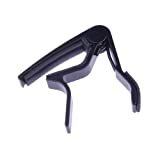 When playing classical music, you will need to have a great acoustic pickup that plays along with your skills. Just like in Cmin, you can start from the C Major scale with a min7 formula (1 – b3 – 5 – b7) or a C Minor scale with a 7 formula (1 – 3 – 5 – b7). 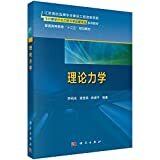 In the end, the result is the same and you will get C – Eb – G – Bb as a result. Cm7 variations can get tricky but are naturally easier than the ones we got before. Starting in the 1st fret with either a bar or your index and 2nd finger in the 2nd and 4th strings you can get the first and more natural version of this chord. 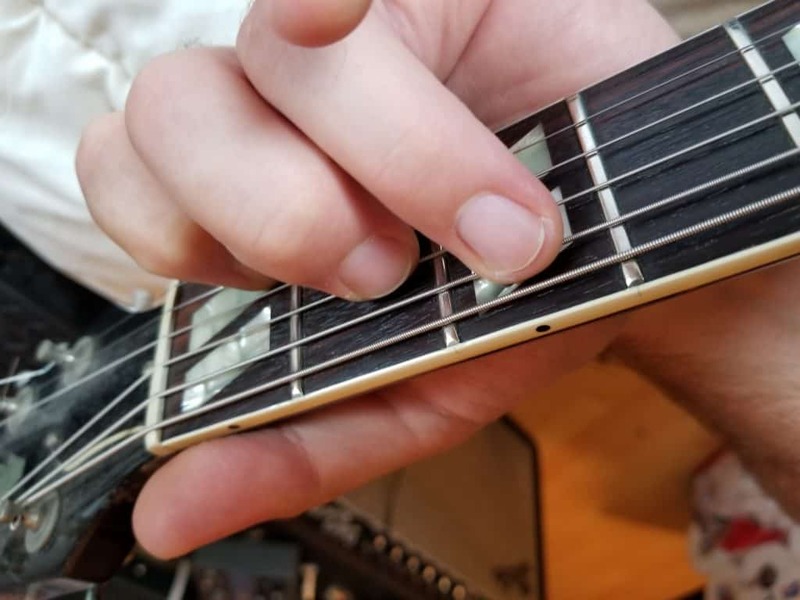 Moving forward to the 3rd and 8th frets there are bar variations that make it easier to move through your guitar neck and leave your 4th finger free to add effects to the notes. The 4th version, in the 10th fret, is what you would commonly use as a pro for songs like “this love” but going for the 8th fret bar variation is pretty acceptable. Finally here is the trickiest version of this article. 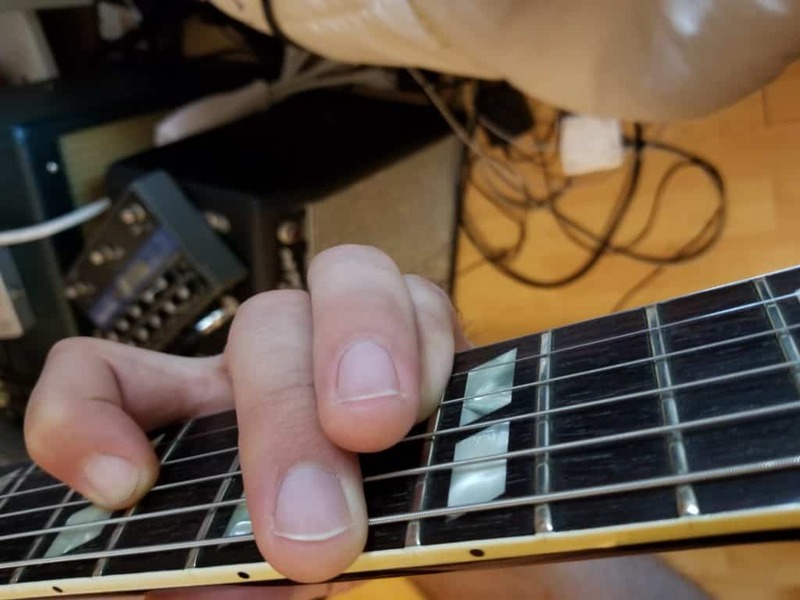 While the 5th more essential way to play the Cmin7 chord is pretty much easy to set, playing the 6th and 1st strings while skipping the 5th instead of muting it, make it hard to actually use correctly. For this reason, this chord is usually left behind for arpeggios by beginners. 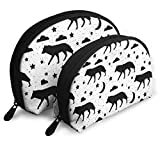 Did you get these ones already? Great! Make sure to go to our B chords guide and keep the music running!